As of October 2018, eight months have passed since seventeen students and faculty members were killed in the shooting at Marjory Stoneman Douglas High School, in Parkland, Florida. This fall, Parkland children can expect a prison-like school with additional screenings, officers, and security measures like clear backpacks. Over the course of spring 2018, thousands of migrant families were separated at the US-Mexico border, and thousands of children suffered in “holding centers” while the fate of their reunification with parents, release to relatives, or deportation was sorted out. Children can expect mattresses in enclosures on floors in frigid rooms with crunchy “foil” blankets. Perpetuating a longstanding family separation program of a different sort, “on any given day, nearly 53,000 youth are held in facilities away from home as a result of juvenile or criminal justice involvement,” and 43 percent and 34 percent of detainees are Black boys and Black girls, respectively—only 14 percent of youth under 18 in the United States are Black. 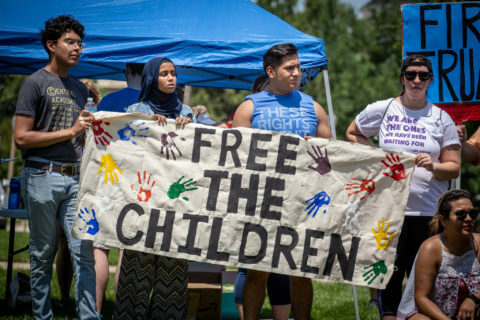 Detained children can expect cinderblock walls, brightly colored jumpsuits, and, when released, continued criminalization. “Safer” schools, “safer” borders, “safer” streets amount to children in cages facing guns. This type of horror is appallingly reminiscent of the forcible separation of Native American children from their parents and their placement in assimilative boarding schools to “save” them from their indigeneity. This resonance is no accident. These movements speak to one another. At a Families Belong Together protest that I attended in Louisville, Kentucky, in July, the organizers gave space to a speaker from Black Lives Matter. This speaker wondered aloud, in so many words, if we care about children being ripped from their families at the border (and we should), then we should care about the Black children being ripped from their families by our “justice” system. At a recent March for Our Lives protest that I attended in San Diego, California, in March, a little girl stood on a wall with the sign “Am I Next?” Across the country, kids marched with red targets on their chests. It was not lost on organizers for Black rights across the country that, if we care about children being gunned down in their schools (and we should), then we should care about Black children, who just do not happen to be at school, being shot in the streets, as happened in Liberty City, Florida—less than two months after the Parkland shooting. Because students of color are more likely to be surveilled and jailed than their White counterparts, we should recognize that added security measures in schools may actually make students of color feel less safe. What’s more, if we care about the over-policing of Black children (and we should), then we should care about the undocumented students in our schools who, every day, live with the uncertainty of possible ICE (Immigration and Customs Enforcement) raids. When we think about children in cages facing guns, we should ask ourselves: whose children, whose cages, and whose guns? Our answers reveal some of the most deeply disturbing elements of our national conscience, or lack thereof. How have we arrived at a moment in our history where it is acceptable to purge, police, quarantine, or tacitly condone the slaughter of the rising generation? This type of horror is appallingly reminiscent of Black babies, children, and parents being separated when they were sold to new plantations. This type of horror is appallingly reminiscent of the forcible separation of Native American children from their parents and their placement in assimilative boarding schools to “save” them from their indigeneity. This resonance is no accident. This type of horror seeks to undercut the unifying power begotten from blood relations. As a cultural metaphor, blood has a uniquely ambivalent set of valences: we endow it the power to bind and mend, but also to leach. We have the shameful blood of the rending thousands of shared intimacies on our hands, and in the person of the current administration. Yet, those on the frontlines of the pro-gun, pro-tough-on-crime, pro-border-security debates in the name of what they see as a very clear “moral truth” rooted in the blood ties of family, look the other way when guns, genes, and steel determine whose lives are worthy. This administration has managed a twisted deployment of truth’s contestability and ushered in the era of “truth isn’t truth” logic. I fumed when the President spewed the “both sides” statement after Charlottesville, because with those words, he bankrupted the multi-perspectival debate structure. But in a sense I, too, am guilty of propagating alternative facts when, in Introduction to Cultural Anthropology, I encourage students to recognize competing perspectives on the world as potentially valid. Indeed, sometimes relativizing truth confirms students’ deepest, darkest suspicions; their racism, their homophobia, their transmisogynoir (transphobia + racism + sexism), are just their valid perspective on the world. Other times it accomplishes what may be anthropology’s greatest gift to its students—the perspective of intersubjective empathy, or the provocation of feeling-turned-understanding that emerges from open, thoughtful, and sustained engagement with elements of the human condition sometimes similar and sometimes unfamiliar to one’s own. Our discipline has long trafficked in the mutual understanding built by practitioners following their gut feelings as they develop in the context of human interaction. Intersubjective empathy may be rapport’s fraternal twin or relativism’s cousin, but it’s a fancy term for a small epiphany. You know it when you feel it—the high of human connection where there was separation, hesitation, or suspicion. It’s the moment when de-centering one’s self-importance becomes both reflexive and exhilarating. 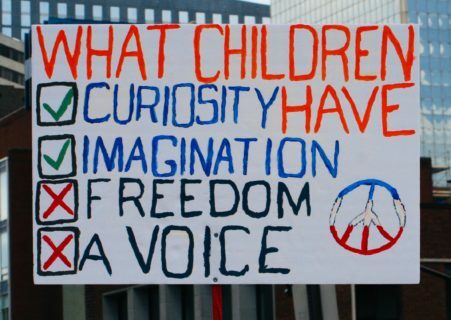 It’s what keeps me hopeful the next generation, our students among its ranks, will find truth in the dignity and safety of all human beings, rather than see children in cages facing guns as a matter of good or bad politics. It’s worth the risk. Jamie E. Shenton is assistant professor of anthropology at Centre College in Kentucky. Shenton is a medical anthropologist specializing in questions of gender, the body, and social change, particularly among lowland indigenous peoples of South America. Her current research focuses on questions of inclusion and exclusion within contemporary social movements.